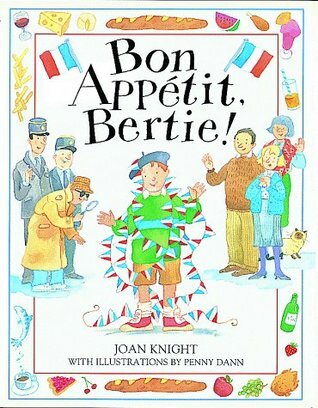 Title : Bon Appetit, Bertie! The Bonfigs win a trip to France. When they get there, the Bonfig parents are too tired to order any supper, but Bertie can't wait. He sets off to explore. His parents wake up to find him gone. Where was he? In the kitchen, ordering supper.It's a cute story with lots of illustrations and a basic introduction to Paris landmarks, hotel words, and food.